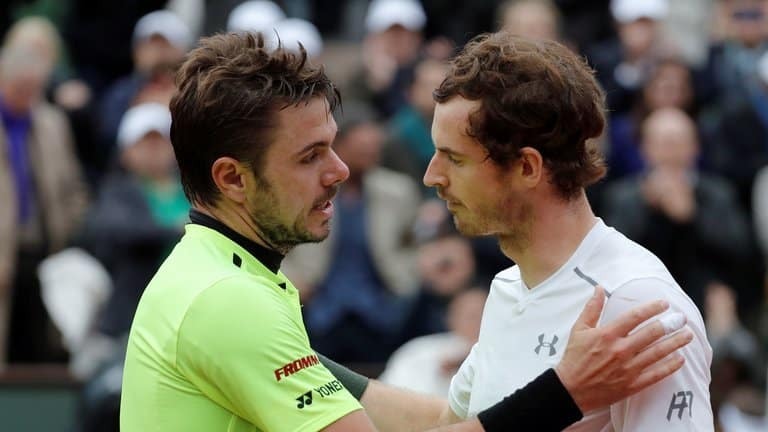 In this semi-final show-down at Roland Garros, Andy Murray of Great Britain and Stanislas Wawrinka of Switzerland are set to face off in what many expect to be a pulsating encounter between two of the game’s highest calibre of players. Unlike so much on a hard-court, powerful flat shots slow down as they are making contact on clay and the byproduct of that is hitting winners really isn’t easy, until you’ve moved your opponent out of position to pave way to do so. The surface lends itself to guys who’s style is to build/constsruct points. Capturing those angles are paramount, whilst power is still crucial, it is saved mostly for finishing off points when up near (Or inside) the forecourt. A savvy clay-courter will aim to move their opponent around by dragging them wide and/or pressing them deep in effort to eventually provide themselves the opportunity to put them in trouble on the next shot from a set of options. (Laying drop-shots, rushing in for a volley, flattening out the ball etc) This is wrestling for court-positional control and then owning the court, before kicking your opponent out of court. Wawrinka is dangerous on all surfaces, but the one where the game he has reaches its absolute ceiling, is the clay. No doubt. When there’s time on the ball, he has crazy racquet head acceleration along with sheer brute strength, that allows for a special skill of being able to manufacture acute angles WHILE still remaining immensely powerful off both forehand and backhand wing. Wherever it is he is positioned on-the-court, if it’s feet behind the baseline or feet out-wide of the trams/alleys, he’s just able to produce a stunning combination of devastating power together with angled accuracy. All done using heavy amounts of topspin, timing & brute strength. With the importance of point construction on clay, topspin arguably is the most crucial component. Using it helps the player develop a reliable, consistent & familiar formula for winning points. Unless guys possess massive weapons with big take-backs that they load-up on (Del Potro, Soderling, Berdych, Chardy) they have to be able to manipulate the ball around. Though even the guys with big load-ups have to use a certain amount of spin, for that control. The forehand is typically the groundie players use to create all the spin for the bounce they need. Whilst Murray’s forehand topspin is reasonable and it has improved, it’s not top notch. It’s not efficient/effortless and it is not the shot he is AS comfortable using in an offensive nature. For me without doubt it’s ‘part’ of the reason he struggles against lower ranked guys on this surface. That lack of an efficient forehand topspin. A natural ability to generate his ‘own’ power/pace on the shot. He doesn’t have a shot on clay which he can heavily rely on as a means of wrestling himself control of rallies through opening up angles and space. On a faster court, Murray can use the pace a little more that’s coming from the opponent, but on clay with how slow the ball comes at you and how high it can bounce from opponent’s topspin shots, it’s simply not possible. Murray and Djokovic’s games centre around movement and both move incredibly on hard-court. They’re able to defend and counter/react against what their opponents fire at them, but with the lesser traction you get on clay court with it being slippery it’s much harder to grip to the surface and suddenly change direction if your momentum is taking you the other way. When on the defensive in the rallies players have to commit a little more to where they believe their opponent is going with shots or they are easily wrong-footed. This was the major reason Djokovic couldn’t neutralise Wawrinka’s bombardment in the final here in 2015 and ultimately why he lost. Struggling to wrestle himself back into rallies, once he found himself behind in the point. If he waited, Stan would wrong-foot him and if he guessed, he would need to guess right. Murray’s offence on hard-court, indoor and grass tends to be to take the ball early with his backhand and flatten it out. Of course on clay taking the ball early in attempt to rush your opponent in preparation for their next shot isn’t quite as easy, since the surface slows the shot down, especially if flat. Wawrinka stands a few feet behind the baseline, taking cuts, so I don’t see him being rushed for any time. The one area of Murray’s game which does lend itself to the clay, is his variety. The ball can die on this surface as we all know and he is the master of cat and annoying mouse, changes of pace, drop-shots etc etc. Murray’s strengths: Return of serve, backhand, movement, touch/feel/variety. Murray’s weaknesses: Second serve, inability to generate pace on forehand. 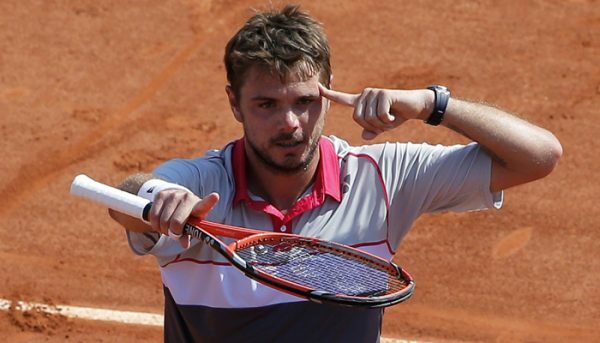 Wawrinka’s strengths: Serve, kicker serve, ability to generate pace on forehand & backhand with angle. Wawrinka’s weaknesses: Return-of-serve (Just chips it back when players’ bang down a first to his single handed backhand, but it is clay, so….) And I guess you could say movement to a certain degree also. To really have success on the clay you absolutely need an efficient topspin forehand or backhand (Preferably forehand) mixed in with the skill of using one of these shots to construct the ball around the court, which can gradually give you more and more of a dominant control in the point/rally. Without this you only survive through means of possessing immense power which you can cut through the mud with. Wawrinka just so fortunately happens to have both (Spin & Immense Power) and that sets a terrifying prospect for Murray, especially with his less stable footing/balance on clay he naturally has compared to when he’s on the hard. He’s gonna really need to be anticipating well. Murray can afford to take educated guesses against lesser opponents when on the backfoot on clay, but Wawrinka’s span of ball-striking options means those guesses will now turn uneducated. Forehand to forehand cross-court duels will always go the way of Wawrinka. Backhand to backhand cross-court duels, with the better angles Stan can capture, edges those too. Both players have the option of flipping-the-script and taking their backhands-up-the-line and Wawrinka has the much better control on his forehand, allowing him more creativity on that wing. Murray can move well on a slippery slidey clay court somewhat better now a days, but if you like to construct your points as Wawrinka does, it’s easier for him to be facing Murray on a surface where he can keep him off balance and out-of-comfort in defence. There are easier opportunities to wrong-foot Murray for Wawrinka on the red-stuff. Objectively speaking unless Stan has one of his ‘missing-in-action’ days, I really don’t see any way for how Murray can stop him. He’s Swiss and Switzerland is a French speaking nation, he’s the closest thing the French know to Roger Federer and he often plays flashy ‘oh la la’ tennis. The crowd therefore will be behind him. He comes into the match on the back of a tournament win in Geneva & five wins here, so he has had plenty of time to find his rhythm which he had here in 2015, as well as two seasons before on the clay in Monte Carlo, where he dismantled Federer. I hate to ever use the term ‘it’s on his racquet’ as especially on slow surfaces, tactics add many variables and we all know Murray has mensa IQ levels on a tennis court, but it really is on Stans’ racquet and we should be looking at the next episode in the trilogy of Rafa vs Stan on Sunday. Who won? I’d assume Stan! Errrm? ????? Never write off Andy so quickly! You don’t get number 1 without a good bit of special talent! You seem to be forgetting that Murray took out Wawrinka at this stage of Roland Garros last year…….. So how did Andy beat him last year? Wawrinka is not the defending champion!